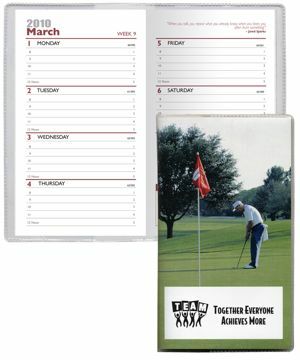 Paper -Photo Insert Planners Personalized in Bulk or Blank. Promotional, Very Inexpensive. Bargain Prices for the USA and Canada. Bulk paper or photo insert pocket planners of 2 types: monthly paper insert planners and weekly paper insert planners, at unbeatable prices: Budget Prices for USA, Canada for wholesale photo insert planners. Union Made in USA. Free artwork design. We will send you a proof for your approval before production. 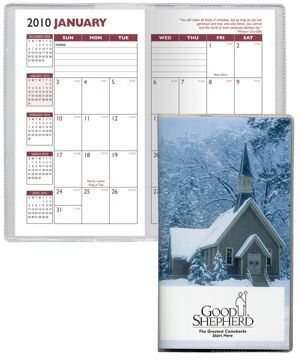 This New high-tech digital custom planner has a clear vinyl cover with your full-color custom digital art inserted. This 32 page monthly insert shows one month on a two page spread. The planner inside is printed in blue and runs 14 months from December through January. It includes pages for important phone numbers and dates as well as advance planning areas. Also included are metric conversion charts, a time zone map, area code table as well as an important holidays page. Unit prices below include your full color imprint on both sides, or they are for blank clear cover planners (without any custom imprint). Setup Charge: $45.00 for full color imprint on both sides. Item# O35-FC Weekly Photo Insert pocket planners. This New high-tech custom digital planner has a clear vinyl cover with your custom digital art inserted. This planner also has a 128 page 2 color weekly insert that shows one week on a two page spread. The planner runs 14 months from December through January. It includes pages for important phone numbers and dates as well as advance planning areas. Also included are metric conversion charts, a time zone map, area code table as well as an important holidays page.